With bold color and a vibrant chevron pattern, this wrapper is suited to a variety of occasions. 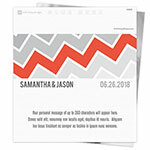 Design: Bold chevron pattern with a pop of colour. Personalization: Names and date on front, back message.